A former winner of ‘Best Drinks Producer’ in the BBC Food and Farming Awards, Derbyshire’s Thornbridge Brewery in Bakewell is considered to be one of the pioneers of the UK’s craft beer movement. Beer-loving visitors to Derbyshire know the winning formula: beautiful Peak District countryside, days spent walking or cycling along its many trails and a pint of Thornbridge beer in the pub at the end of the day. They’ve already tasted the award-winning cask ales and beer produced at the local Thornbridge brewery in Bakewell and know they’re pretty special. They have great names too, like the Thornbridge Cocoa Wonderland, a robust and full-bodied chocolate porter that won 3 gold stars at The Great Taste Awards. So next time you visit, don’t just sink your spoon into Bakewell’s famous pudding and sip a cup of tea, make sure you do some serious beer tasting on your travels. Better still, take the Thornbridge brewery tour to see how they make it. It’s an easy 10-minute walk from the centre of Bakewell to the riverside brewery and there’s a guaranteed drink at the end of it. What’s not to love? Did you know that unlike the USA, where the craft beer movement took hold in the 1970s, it wasn’t until 2002 when craft breweries started to take off in Britain? The catalyst was the introduction of tax breaks for smaller breweries announced by Gordon Brown in his budget. In the space of just 15 years the number of breweries in the UK tripled from around 500 to more than 1,500. By experimenting with new ingredients and different processes, it opened up a whole new market for craft beer aimed at the more discerning British beer drinker. Thornbridge brewery was one of the UK’s early craft beer pioneers. It started brewing beers back in 2005 when the brewery was originally based in the grounds of the rather grand Thornbridge Hall, a 100-acre estate situated in the Peak District National Park. Owners, Jim Harrison and Simon Webster, recruited two bright young brewers to brew on a second hand 10-barrel kit. They set to work producing a range of cask beers. Although the initial focus was to follow traditional recipes, in true craft beer tradition, they added a modern twist by experimenting with a wide range of different hops, malts and herbs. One of their early successes was Jaipur, a 5.9% IPA. It’s packed with American hops a move that was innovative in the brewing industry at that time. The business quickly grew and the awards starting rolling in. They now have hundreds of impressive national and international awards. As a result, they opened a new state-of-the art riverside brewery and bottling line in Bakewell to cope with increased demand. This expansion continues today with a brand new visitor’s centre in the pipeline which is due to open in the summer of 2019. Tours of the brewery are scheduled every Wednesday, Thursday and Friday afternoon at 3pm. Like all good brewery tours, it starts with a guided introduction to the brewing process and ends with a tutored tasting of their beer. The tour costs £10 for adults and takes around 1 hour and 30 minutes. The sampling session includes three halves of award-winning beer. You drink it from a Thornbridge branded glass that’s yours to keep as a souvenir. Of course, at the end of the tour, you can browse the well-stocked brewery shop and take your favourite beers home with you. Halcyon (IPA) – ‘Chewy, juicy, biscuity malts and intense pineapple fruit flavours and citrus hoppiness combine with a hint of tangerine and pear drops’. Beadeca’s Well (Smoked Porter)- ‘The smokiness of the peated malts is matched by a smooth taste of toffee, caramel and dark fruits’. Ready to start tasting Thornbridge beers at home? Try this Thornbridge Brewery Discovery Pack. For beer tasting without doing the brewery tour, pop by for a pint in the Tap Room. It’s dog friendly and open from Wednesday to Saturday. As you’d expect, you can choose from Thornbridge bottles and cans plus 6 different keg lines and 4 cask lines. If you’re a serious beer explorer, put a date in your diary for the Thornbridge Peakender and start shopping for great camping gear. The Peakender beer festival first kicked off in 2014 and continues to go from strength to strength. It’s ideal for beer-loving campers who fancy a weekend away in the glorious Peak District. In 2019, the Peakender festival will take place at Bakewell Showground from 16th-18th August. It’s your chance to discover and meet the very best UK breweries, taste different beers including a huge selection of Thornbridge beers. To complete the festival line-up, there’s tasty street food, live music and entertainment throughout the weekend. Both camping and glamping options are available. If you’d prefer to stay in a local pub. 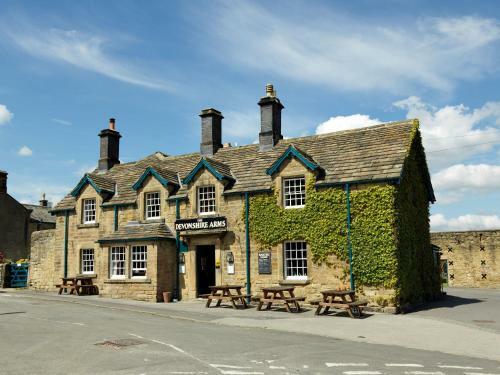 The Devonshire Arms at Pilsley is only a short drive away from Bakewell. You can take me with you for a drink at the Thornbidge Brewery Tap Room. Find more Foodie Things To Do in the Peak District. Discover more UK Brewery Tours.